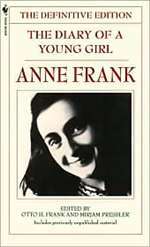 Anne Frank's The Diary of a Young Girl is among the most enduring documents of the twentieth century. Since its publication in 1947, it has been read by tens of millions of people all over the world. It remains a beloved and deeply admired testament to the indestructible nature of the human spirit. Restored in this Definitive Edition are diary entries that were omitted from the original edition. These passages, which constitute 30 percent more material, reinforce the fact that Anne was first and foremost a teenage girl, not a remote and flawless symbol. She fretted about and tried to cope with her own sexuality. Like many young girls, she often found herself in disagreements with her mother. And like any teenager, she veered between the carefree nature of a child and the full-fledged sorrow of an adult. Anne emerges more human, more vulnerable and more vital than ever.